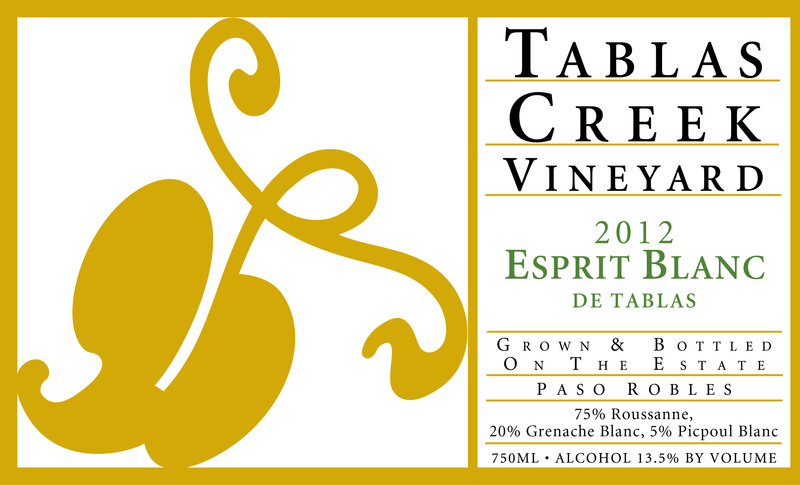 The Tablas Creek Vineyard 2012 Esprit de Tablas Blanc* is a blend of three estate-grown varietals, propagated from budwood cuttings from the Château de Beaucastel estate. Roussanne provides the core richness, minerality, and flavors of honey and spice, while Grenache Blanc adds green apple and anise flavors, a lush mouthfeel and bright acids. Picpoul Blanc completes the blend, adding a saline minerality and tropical notes. The 2012 Esprit de Tablas Blanc has an inviting nose of preserved lemon, panna cotta, green pear, buttered toast, anise and wet rocks. The mouth is rich but dry, with flavors of butterscotch, apple pie, marmalade, candied pineapple and ginger, and gentle acids keeping things clean. The long finish is luscious and spicy with lingering flavors of peach pit, gingersnap and mineral. Absolutely delicious now, so don't feel bad about opening one soon. But it you want to age it, we expect it to go out 15 years or more and to gain nuttiness and complexity with time. The 2012 vintage was a classic Paso Robles vintage, warm and sunny, but with above-average yields thanks to average winter rainfall and the frost-reduced 2011 crop. Despite the warm summer, ripening was slowed due to the healthy crop levels, and harvest at a normal time starting in early September and finishing in late October. The resulting wines showed lush, juicy fruit, balanced by good acids, and should provide enormous early appeal. Our Roussanne was harvested between September 7th and October 22nd, Grenache Blanc between September 21st and October 15th, and Picpoul between October 4th and 15th. The grapes for our Esprit de Tablas Blanc were grown on our 120-acre certified organic estate vineyard. The fruit was whole cluster pressed, and fermented with native yeasts. The Roussanne was fermented in a balance of stainless steel fermenters, 60-gallon oak barrels, and one 1200-gallon foudre. The Grenache Blanc was fermented partially in stainless steel and also in one foudre, and the Picpoul Blanc was fermented in small neutral oak and stainless steel barrels. All the wines went through malolactic fermentation. The lots were selected and blended in April, and bottled in September 2013.